Marketing through mobile devices is not a new concept, however, shopping through a mobile device is still a relatively unknown field for many consumers and retailers alike. And as with all unknowns, there are several myths surrounding mobile commerce that are confusing retailers and delaying them from truly understanding the value of mobile commerce. Below are just some of the most commonly misunderstood mobile commerce myths. In the early days of mobile marketing, where SMS messaging was as far as your strategy would go, mobile often sat under the ‘direct marketing’ umbrella. But times have moved on. Smartphones have evolved to the point where they have become an indispensable part of the shopping journey, sometimes replacing desktops or physical shop visits altogether. 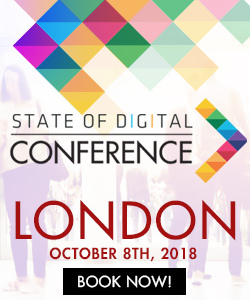 Defining mobile as just another ‘channel’ indicates that it is therefore an optional channel, or one that merely needs to be considered for sales attribution, but with 66% of the UK population now owning a smartphone and using it regularly to browse and shop for products, retailers can no longer afford to ignore mobile. Instead, they need to think of mobile as a user experience, holding as much value as desktop, and brick and mortar. Having a mobile commerce strategy that works in combination with all other digital marketing activity, as well as brick and mortar (if applicable) will strengthen the relationship between retailer and customer, provide a much better omnichannel shopping experience, and ultimately increase loyalty. Many retailers are under the impression that in order to successfully sell their products via mobile and to attract the right audience, they need to develop a mobile shopping app. The costs associated with creating, maintaining and promoting a good app can be prohibitive for smaller retailers, and therefore the assumption has become that only larger retailers with big budgets can truly be successful on mobile. This is most definitely not the case. Mobile commerce doesn’t necessarily mean mobile app, in fact many shoppers don’t want to download yet one more app that they may never use again. The shopping journey has become one with a number of touchpoints, often starting on one device for initial research, and finally finishing the journey on another completely different device or even by visiting the physical store. With so many touchpoints and devices involved throughout the decision making process, it’s important that every touchpoint offers the shopper the same level of user experience. If your brand has a fantastic app, but the website doesn’t work on a mobile, then the shopping experience will be marred for those browsing your website on their mobiles regardless of how fantastic your app is. For those retailers looking to make sure their mobile visitors convert into customers, the first priority should be to create a great responsive site or a mobile site that’s easy to use, quick to load, that offers a seamless checkout journey on mobile, and isn’t too fussy or complicated when viewed via a smaller screen. Simplicity and ease of use is key. 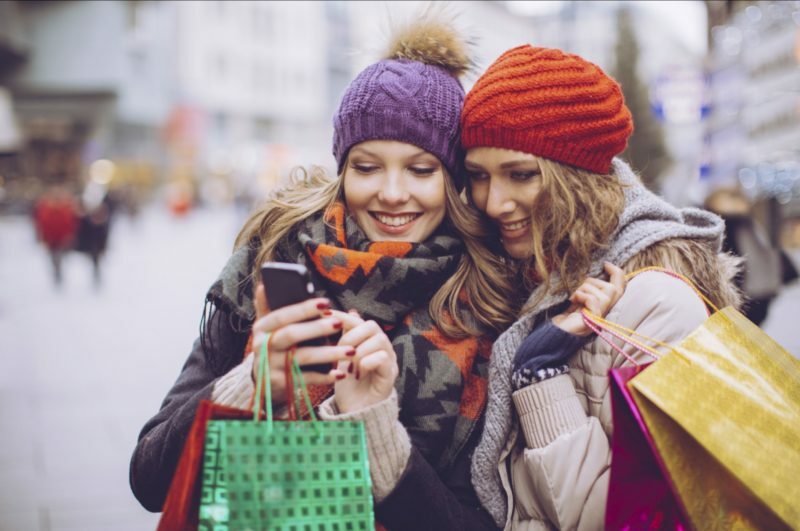 It’s often assumed that millennials are the only ones shopping via their mobiles and that it’s therefore not necessary to have a mobile commerce strategy in place if your brand targets an older audience. It may be true that millenials have grown up during the mobile outbreak and therefore have more aptitude to shop online, however other age groups are increasingly turning to their smartphones to research and purchase products. Recent studies show that older generations, including Baby Boomers, are embracing mobile as a local shopping companion. According to a study conducted in 2015, over 55s are the group most likely to use the internet for price comparisons before making a purchasing decision (68%) and more than two-thirds of this age group that use the internet will go online every day. 35-44 year olds are the group most likely to switch between multiple devices when browsing online, using computers, smartphones and tablets in order to fit internet browsing into a busy work and family life. This time-poor age group is also the one most likely to purchase online (53%). 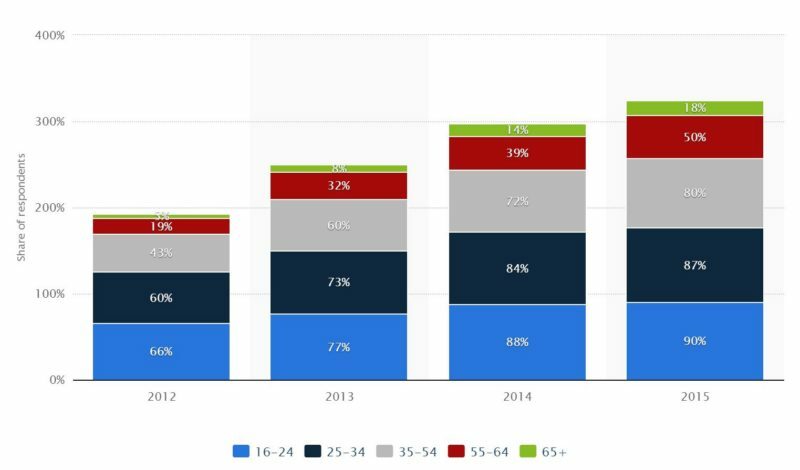 And with smartphone ownership penetration in the UK (see graph below) continuously increasing among the 35+ age group, more and more consumers will be turning to their smartphones for shopping. Whether the consumer ends up purchasing via a mobile is irrelevant, because it’s likely that their journey will start on a mobile, during the research phase. So, while your brand may not experience high conversion rates from mobile, it’s still crucial to capture traffic at the early research phase, and ensure that the experience is good enough for visitors to come back, or to want to visit your store after seeing your website. It’s true that mobile commerce is gaining popularity and that more consumers are choosing this medium for its convenience, and that is unlikely to slow down anytime soon. Retailers are much better off embracing the growth of mobile commerce rather than seeing it as a threat. Ensuring your brand has a good digital presence across all devices is just as important as ensuring that your shop window has an engaging display and that your shop floor is adequately merchandised. Although it’s unlikely that mobile will ‘kill’ brick and mortar retail, it’ll very likely become a more important factor for decision making. In fact, retailers that understand the way the consumer journey has evolved and the different touchpoints and devices used before a decision is reached, are the ones delivering better shopping experiences. Showrooming is not a threat, and if factored into the overall marketing strategy, can deliver some very rewarding results. According to a Forrester Research project, 40% of consumers use mobile to research products, yet a majority of those same consumers are most likely to make their purchases in-store. Mobile actually influences 21% of total retail sales, which is significant and likely set to grow. It’s a common misconception that mobile only reaches those who are travelling, and is therefore irrelevant if your brand wants to target consumers shopping from the comfort of their own home. As already mentioned in this article, smartphones are increasingly replacing laptops and computers, and more and more consumers will turn to their smartphones to research and purchase products, where previously they may have used a desktop. 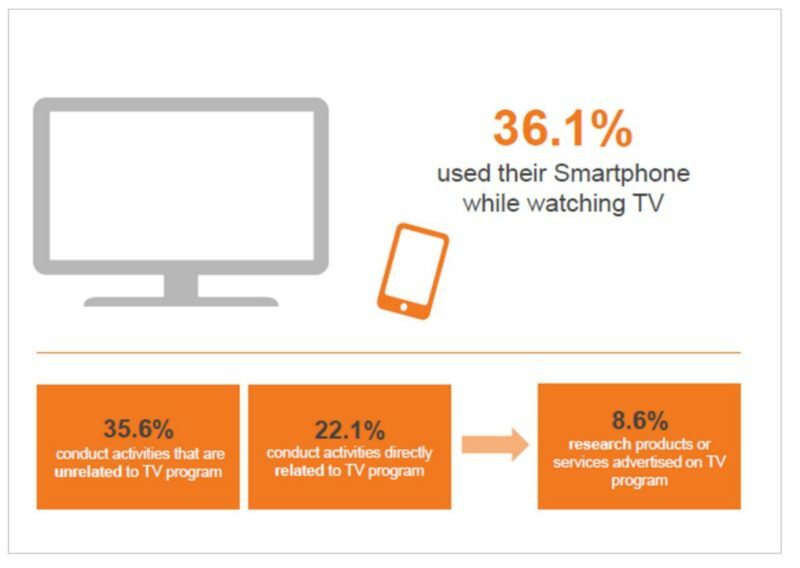 More recently, Google reported that 52% of all smartphone users watch television while on their smartphones, and a study conducted by Telefonica’s O2 and Sony Mobile showed that 75% of respondents used their phone while in the bathroom. This is considerable and highlights the growing trend of consumers researching, browsing and shopping via smartphones while in the home. The graph above further highlights the opportunity here, that just because consumers may be at home does not mean they will turn to their desktops instead of their mobiles for shopping or browsing. It therefore remains crucial that the mobile experience be as good as the desktop experience. So there you have it, five mobile commerce myths debunked and the facts revealed. Let me know if you have heard any other common misconceptions about mobile commerce and we’ll get to the truth! Joana Veiga Ferreira is a Digital Marketing Consultant based in Manchester. She specialises in digital strategy and helping small and medium sized businesses figure out where they should be placing their marketing budget. 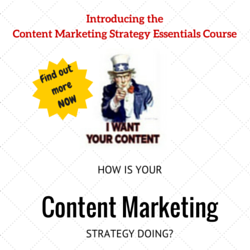 Content marketing, social media and PR are her topics of choice.